Invisalign Gives You the Perfect Smile Without Metal! Dr Kathy’s practice is the first Invisalign only office in LA and the country. Studio City Orthodontist opened its doors in 2014 and serves people all over Southern California. Dr Kathy has been practicing orthodontia for over 20 years and has helped thousands of patients correcting their misaligned teeth and improving their oral health which translates to better overall health. With amazing results and affordable prices, Studio City Orthodontist is THE place for Invisalign in Los Angeles, Beverly Hills. If you are considering Invisalign braces , call the office and get a complimentary consultation. 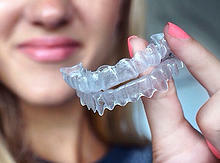 Invisalign® uses a custom-made series of aligners created specifically for you using a digital 3D scanner called iTero. The aligner trays are made of virtually invisible plastic, are completely smooth and fit perfectly over your teeth. You will wear the aligners all of the time, except when you are eating and brushing and they will gradually and gently shift your teeth into place. This movement is based on the plans your orthodontist maps out specifically for you. No metal brackets and no wires, so no tightening or breaking. Depending on the treatment plan, you may need Invisalign Attachments or IPR (Interproximal Reduction). You just put in new set of aligners approximately every two weeks, until your treatment is complete. You can achieve that perfect smile without interfering with your life. It’s that easy! By the way, it can get even better if you use the state of the art Accledent device. It can cut your treatment time in half! Invisalign can treat most cases, from the simplest crooked teeth, to the more serious cases with multiple treatment needs. The latest in technology has allowed for precision cuts to be made into the aligners so things like elastics can be attached to treat more complicated cases. Invisalign costs the same as braces, but allows you to get a perfect smile discretely and with all the freedom of wearing nothing at all. Made of clear plastic they don’t irritate your mouth or gums and can be taken out at anytime. They also can fit into even the busiest of schedules since appointments are only every 6 weeks. So there you have it. If you would like to schedule a Los Angeles Invisalign consultation with Dr. Kathy or find out how much Invisalign is and if it is right for you, give us a call at 818-452-5688 and figure out the best way that we can help you have the smile you deserve.